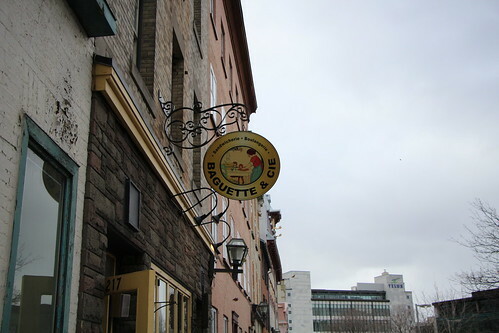 We came across Baguette & Cie along our way back to the hotel on our last day in Quebec City. It was absolutely freezing that day, wind chill and even flurries. As we were a little bit famished we saw this cozy looking bakery, what actually attracted us to this place other than it being conveniently just minutes away from our hotel was that it sold hot soup. Soup on a blistering cold day is all you would ever want and is it ever so satisfying. 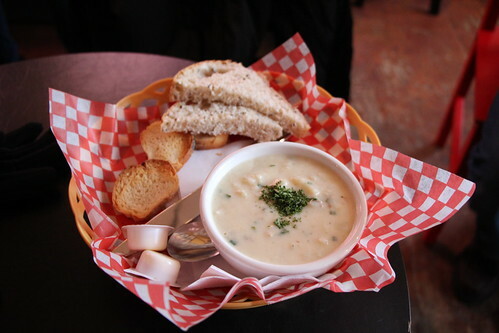 Their Clam Chowder is creamy and yet still smooth to the taste and has a lovely aroma to it. Flavour-wise it’s delicate balance of ingredients makes it the perfect winters meal. The only thing I guess I would have liked is if the bread was toasted/warmed just a tad. 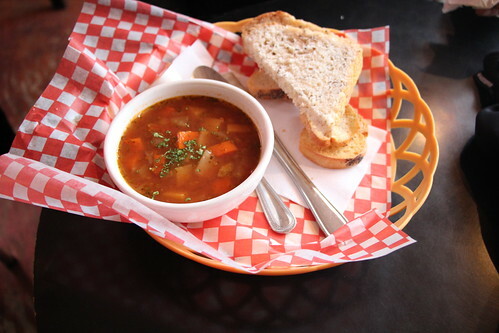 If you’re looking for something a bit lighter, the Vegetable Soup also has amazing flavours. The chunky vegetables make it a pretty satisfying meal or snack (if you prefer). Baguette & Cie not only serve soup but of course bread as well and in addition they offer muffins and pastries, hot drinks, sandwiches and desserts plus their apparently renowned chilli! I’d definitely recommend stopping by. On our last night in Quebec City it was absolutely freezing so we dared not venture too far out at night. 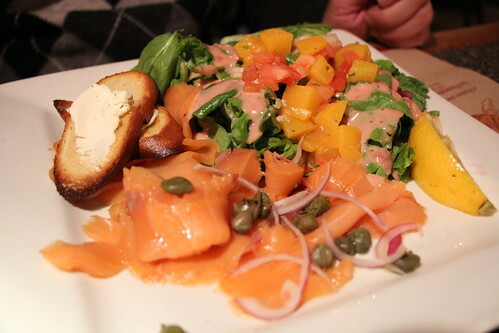 Luckily, right across from our hotel is Bistro Le Brigantin, a Italian restaurant on the corner block. 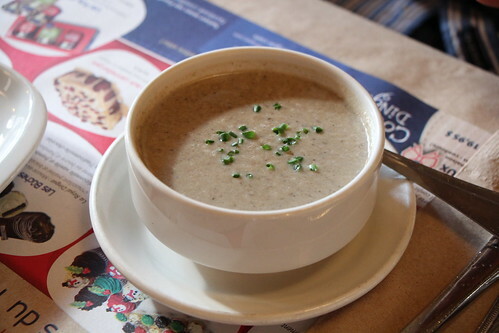 We weren’t that hungry as we had soup and bread from Baguette & Cie in the arvo. It’s a lovely little restaurant that for some reason didn’t seem to be that popular. It might be because most of the visitors were in the city centre and not near the bayside. We ordered a Tomato based Penne Pasta with parmesan cheese on top. 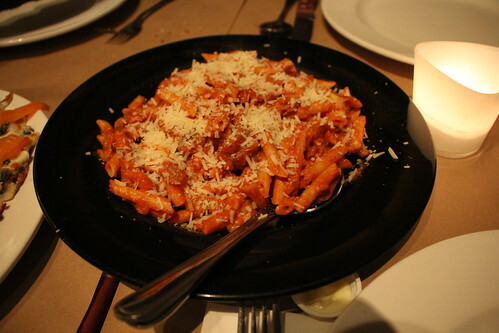 The pasta was perfectly al dente, and the tomato flavour was so flavourful and yet not oily. Adding a bit of chilli flakes just makes it delicious. I was really quite surprised of this gem of a restaurant that seemingly was mostly empty at night. Top notch. 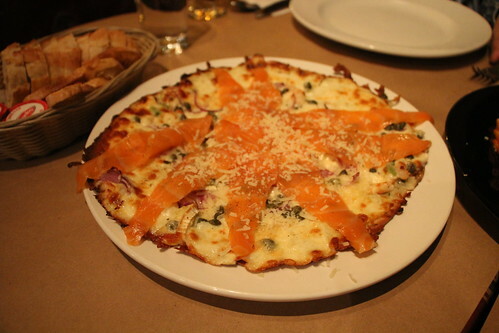 Their salmon baked pizza was also just divine. 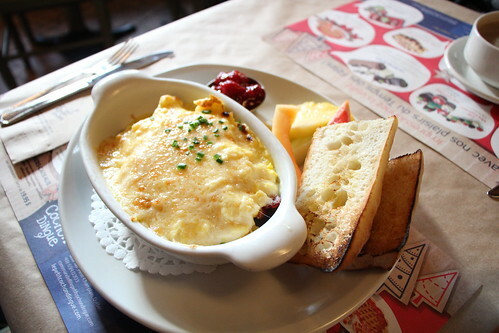 Crisp and crunchy bottom, with a very cheesy and fresh salmon on top with cooked onions and herbs. It isn’t like your typical pizzas with a crust and a thick bread bottom, this instead lets the toppings come alive. For something that may seem small, it packs full of flavour and is actually filling even though it was shared between three. 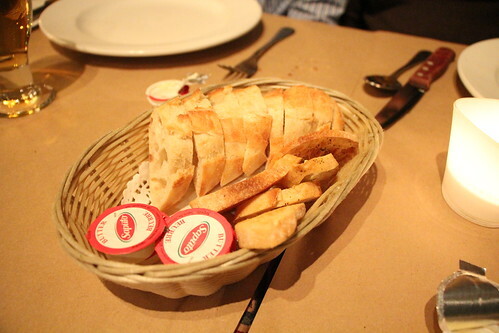 It might have also been because we ate a lot of the bread as a starter. You really can’t go wrong with bread and butter, their airy bread is light and fluffy inside but with a very crunchy crust. Love it. I loved this Italian restaurant, I never would have imagined Quebec City to have great Italian food. Colour me surprised and very glad to have dined here. 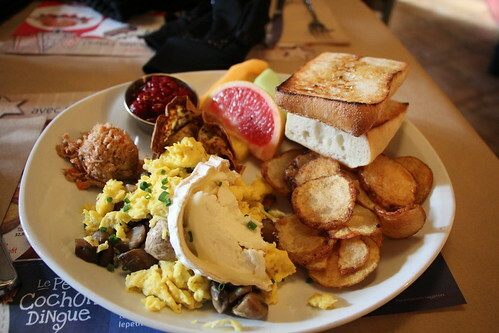 Fantastic, flavourful food, with excellent service. Le Chic Shack in Old Quebec is one of those trendy Burger joints aka gourmet fast food. 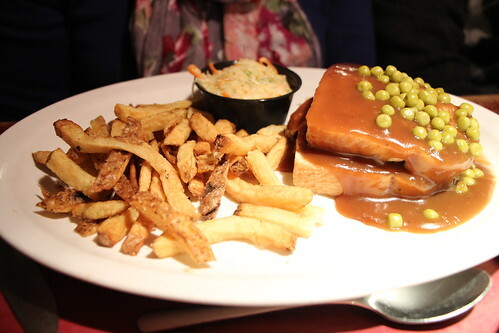 In the old part of Quebec City, I found it pretty difficult to find a reasonable priced meal for dinner. That and it was too bloody freezing to take more than half an hour to look around at whats good. 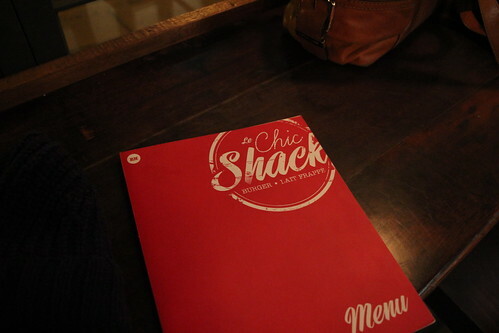 We eventually stumbled upon le Chic Shack and after checking out the menu it seemed like a decent place to dine in. Like a Fast Food eatery, you order at the register. Menu is painted on the walls, along with menus at the tables and at the register. We weren’t particular hungry so opted for smaller, lighter options. 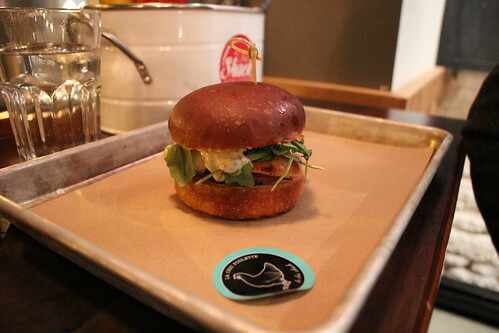 As you can see they add stickers to their dishes, this particular burger at le Chic Shack is called the La Chic Poulette, which includes Grilled chicken breast, cheddar, arugula, red onion, tomato, pickles, remoulade and brioche bun. The bun here is a tad well done, but crunchy it is. The chicken is well cooked, not tough like some grilled chicken can be and the dressing is much needed otherwise it’d be a big too dry for my liking. 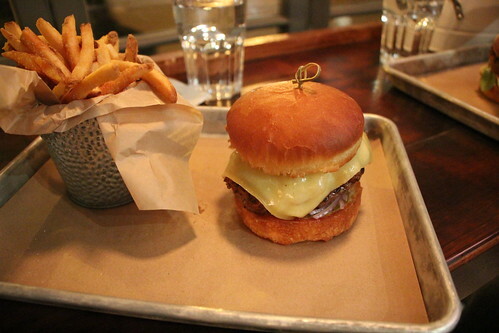 Overall, it’s a great little burger but definitely on the pricier side of things at $11. You can order chips as a side, $4 for small or $6 for large with a choice of normal or sweet potatoes. I’m not a big fan of sweet potato fries because they are commonly too soft and not crunchy enough for me to consider them chips, so it’s more than likely I’ll order normal potato fries. The fries here are salted well, not too much. Some places will over season chips with their salt and it’s a majorly off putting. The chips here are nice and crunchy, and just the right size. I love crispy chips and here they are done reasonably well. Being Quebec, I couldn’t not order their poutine. 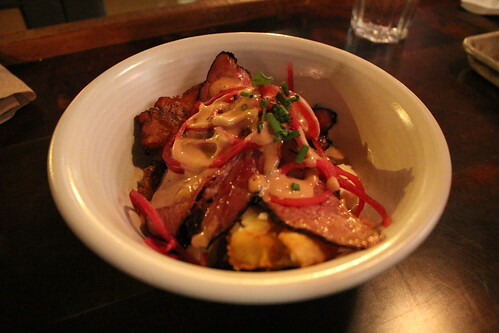 What they call La Fumee is basically their thick cut chips mashed slightly (crispy still) accompanied by smoked meat, chic sauce, cheese curds, swiss cheese, pickled onions and fresh herbs. Their sauce is this kinda sweet, mayonnaise like sauce. I loved their chunky bit crispy chips and eating them with the smokey tender meat and stringy cheese it just works well together. Looking at it, you may think for $11 + tax, it isn’t worth it but I can say it is very satisfying because of all that starch, carbs and protein. 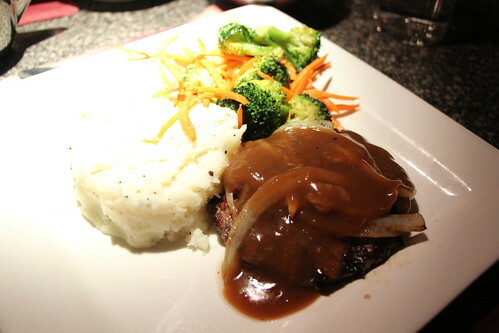 Adding just a little bit of tabasco, as you do, is all that is needed to liven up what is already a great meal.